An outstanding, unfiltered premium absinthe made from several herbs which include grande and petite wormwood, anise, fennel and hyssop, a grape-base alcohol, no added sugar, and is bottled at 72°, in order to hold the natural colour and present the aromas to the fullest. Made by following the distillery's own technique of distilling each plant separately, blending the resulting full alcohol distillates and then finishing with an 'esprit vert' ('green spirit' - a natural maceration of additional plants, including veronica (Speedwell) in grape spirits) which is mixed in during the final colouring stage of production. It louches beautifully, and is complex and intense. Sure to please those who are searching for a spicy, yet traditional absinthe. It represents one of the best quality/cost values in modern traditional absinthes. 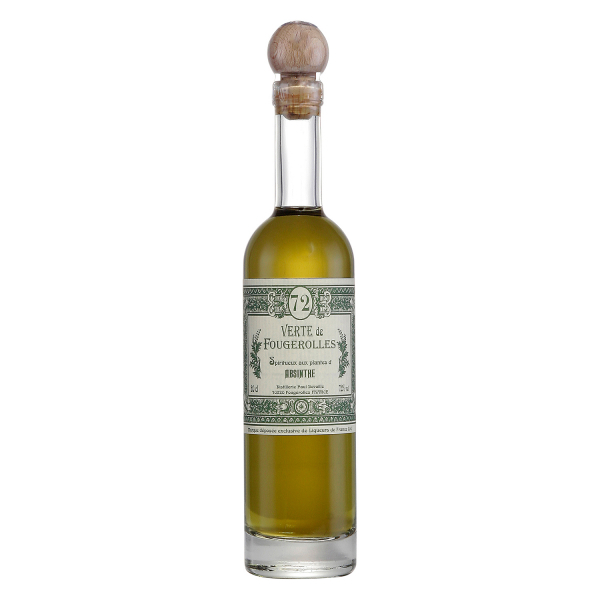 Related links to "Absinthe Verte de Fougerolles"
Customer evaluation for "Absinthe Verte de Fougerolles"
Maybe my rating (above) is a little misleading in a way. This was the first of absinthes I tried (together with the more inferior Lemercier Abisinthe 72 from another vendor) so it was a while ago. But what I can remember is that it\'s a quality absinthe and not too powerful, and especially not floral to a degree that almost reminds of some perfume. Harmonious, as Fenris before me described it, is a really good word for Verte de Fougerolles. Ich habe noch nicht so viel Erfahrung, aber dieser Absinth hat mich von der ersten Sekunde an überzeugt. Das Anis-Aroma is deutlich, aber nicht zu aufdringlich. Der Wermut ist kräftig und doch angenehm und die gesamte Abstimmung ist harmonisch, recht komplex im Aufeinanderfolgen der Aromen und trifft meinen Geschmack genau.